Nor Sanavongsay is a Lao-American illustrator and writer living and working in San Francisco area. He’s created award-winning projects for Encyclopædia Britannica, Sears, and is currently designing interfaces for Barnes & Noble NOOK. He is currently working on the Xieng Mieng children’s book series and a character known as Kiwi the Green Koala. He recently launched a kickstarter to finish making the first Xieng Mieng Book at http://www.kickstarter.com/projects/nawdsign/lao-childrens-book-xieng-mieng-adventures . Gently, easy-going and usually quiet, he was incredibly talkative about finally making this new book. Many of us who’ve known him since his days with the SatJaDham Lao Literary Project remember his enthusiasm and excitement over 10 years ago. It’s a labor of love for Nor, who’s also been helping so many other Lao projects and his fellow artists. He’s got fans across the country, but has usually kept a low-profile when talking about himself. But I think you’ll agree he has an inspiring story. This January, I was able to convince him to do an interview for Little Laos on the Prairie. Thanks for talking with us, Nor. Can you tell our readers a little about your family and how did you get your start? My family is from Laos, but I was born in Mukdahan, Thailand, my mother’s hometown. We were sponsored by an American family and arrived in the U.S. as refugees in the winter of 1979. We landed in Kingsport, TN and lived with our sponsors for half a year. After that, we moved to Elgin, IL where I called home for thirty years. I grew up and went to school in Illinois. I had many artistic influences growing up. My uncle, who stayed with us while I was in grade school, helped develop my drawing skills. I continued drawing all the way through high school and college. I was into comic books and Saturday morning cartoons. I had always dreamt of becoming a comic book artist or cartoonist. In college, I continued my illustration path and took many classes on becoming a better illustrator. I worked for the school newspaper for a few years and also published a popular comic strip drawn from the events of my college life. Was your family supportive of your interest to get involved in the arts? Who are some of the other community members who’ve helped you along the way? with me when I was younger. His way of story telling has encouraged me to be a story teller myself. My brother, for introducing me to a Lao literary group of which he helped started called SatJaDham. The group opened my eyes to a broader view of Lao literature. I would especially like to thank the Lao Heritage Foundation for sticking with me and promoting my work through all this time. Without them, I would not have pushed myself hard enough to make it perfect. This is a project that’s been in the making for almost 14 years. That’s a long time. What are some of the things you’re most excited about? design and programming. One aspect of the project that I’m particularly excited to present is this unique story-telling method that I developed. 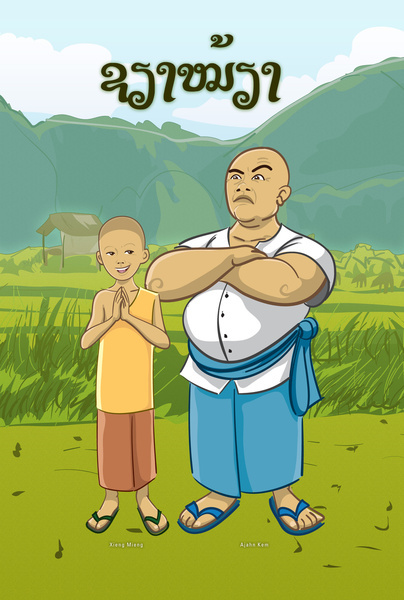 It incorporates Lao and English in a way that kids will be able to understand. My passion is creating things for people to enjoy. In creating this book, I’m utilizing all the skills that I’ve learned. I believe I’m picking the right amount of things to put in the book to make the experience of reading truly enjoyable. I hope it ends up on all your bookshelves. Why do you think people love Xieng Mieng so much? What’s your favorite Xieng Mieng story? Xieng Mieng is such a unique and memorable character. He embodies a lot of the characteristics that people secretly want to be. He’s clever in his problem solving abilities and can get away with things that most people would not be able to. My favorite story is the one where he tricks the elder monk to clean up the chicken poop in the most peculiar way. I love this story so much that I’m making it my first book in the series. Who do you look up to as your artistic role models? When it comes to role models, I have a few but I’ll name the most influential. Bruce Lee is the main person who influences a lot of the way I think and approach things in life. I read a lot of his books and learn about his philosophies. I adapt his teachings to my way of life. It’s not that well know but Bruce was a great artist himself. I try to make things simple and reduce a lot of the complications. What would be your advice to emerging artists and writers? I always say that to get better at something, do more of it. Talent takes time. If you want to get something done, you make the time, but if you don’t, you make excuses. Find something that you have a passion for and keep working on it. If you love what you do, it won’t feel like it’s work. Next PostLittle Laos on the Prairie February Writing Contest!